Interested in exhibiting your art in our shop? 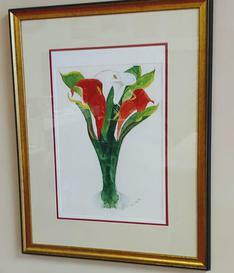 A custom framing shop and art gallery owned by long time framer, Valerie Johns and built on a reputation of quality, creativity, and individualized attention to the needs of our customers. Valerie assumed ownership in Dec. of 2017 and was previously the owner of Up Against Your Wall, with her husband Dan. She is thrilled to take over such a well respected business. She will continue to offer the high quality products and service that this shop is known for and hopes to continue rotating exhibitions of award winning local artists in a variety of media throughout the year. Currently showing the stunning watercolors of Jan Taylor. Meet the artist at our FIRST FRIDAY GALA on August 3 from 5-9.